Cleanliness is one of the most important factors in maintaining good health at home and work. It is even more important in care facilities. People with compromised immune systems should not be exposed to any germs or bacteria. That’s why we offer extensive terminal cleaning, ensuring a healthy environment for everyone. From hospital cleaning to office cleaning, we take care of it all in Athens, GA. Hospitals and nursing facilities are places where ill people go to get better. Make sure your location is the most sanitary environment possible for maximum healing. Due to their nature, health-care environments harbor bacteria which could potentially make patients or even your employees ill. Howard Janitorial Services ensures that the spread of these germs is minimized to keep the focus on healing. Rest easy knowing infectious bacteria won't harm your patients and workers with our ever-evolving techniques and cleaning solutions. Our thoroughly trained cleaning staff is up-to-date on the latest terminal cleaning processes, and we strive to use only the safest and most effective cleaning chemicals. Whether you need a health care facility or an office building sanitized, Howard Janitorial Services has your back. Let’s face it; there are different levels of cleanliness expected in certain settings. It’s one thing to mop your kitchen floor at home once a week, but a kitchen or bathroom or patient room in a hospital is a completely different situation. These areas are expected to be cleaned on a routine and regular basis. To reach expected and recommended levels of cleanliness and care, it makes sense to have a team of trained and experienced professionals to ensure everything is completed to the highest standard. When you are seeking hospital cleaning in Athens, GA, call upon the team at Howard Janitorial Services. There are regulatory standards for cleaning in many facilities, and we can meet those for you. 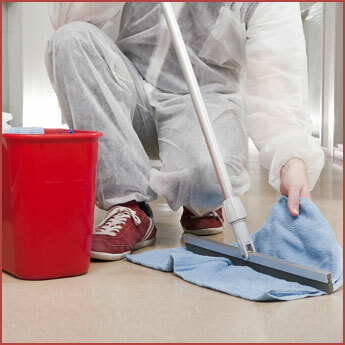 We are trained in the safe use of the latest cleaning products and techniques and are fully aware of problem areas known to be sources of contamination and illness. Those areas get extra attention above and beyond the high level of cleaning we provide to the rest of the facility. We make sure every area is clean from windows to walls to floors to door knobs and all other areas of high exposure. There’s much more to institutional upkeep, such as terminal cleaning, than just sweeping and dusting. The patients, staff, and public depend on everything being clean and safe to touch at a medical facility, and travelers expect the same when they pass through a terminal. Regular, thorough cleaning is known to prevent the spread of many illnesses and conditions. People do not go to the hospital to get sicker; they go there seeking healing, and a spotless environment plays a part in recovery. The staff of Howard Janitorial Services provides more than just hospital cleaning. Yes, we clean, but we also go the extra distance to sanitize as well. Sanitizing is the next level of care which occurs after something has been cleaned. Think of sterilizing a medical instrument as an example; it is cleaned and then sterilized afterward to kill any errant germs and bacteria. While we don’t sterilize hospital equipment, we do provide just as much care to any areas which require sanitization beyond regular cleaning. Get the peace of mind from knowing your hospital, terminal, or business is thoroughly clean when you choose us. Contact us today to get started. Contact us [Link to: Contact] for more information or to book a time when our staff can clean your property. We proudly serve Athens, GA, and the surrounding area.